Stark Drive Mini is now live on Indiegogo for only 299 USD! We would like to introduce everyone to the Mini (our standard and carbon belt drive variants below as captured in full 3D. 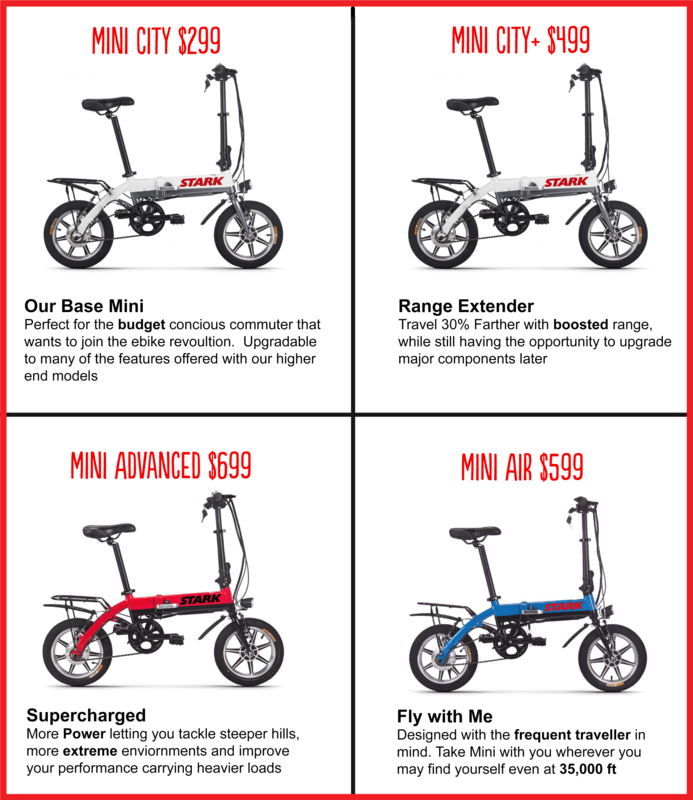 As you can see we have worked hard to configure MIni to be both agile, light and fully featured with the ability to easily and quickly upgrade the bike just by purchasing components from us that are made to fit together with the bike like lego. The battery is hidden within the frame and easily removable to charge when you are on the go and with a weight around 13kg you can easily take Mini with you, wherever you may find yourself. Especially useful is the folding feature which makes Mini Ultra Compact to fit in the tiniest of places. In order to save even more weight and offer a cleaner alternative to a standard steel chain we have a variant of Mini that includes an oil and hassle free Carbon Belt Drive System. It also includes powerful disc brakes as well as unique features such as cruise control that are not available on any standard bikes that we know of at this price bracket. Which is all about Torque. You see unlike Stark Drive and Stark Drive Mini which operate using a hub motor, Stark Drive Torque uses a torque based sensing system which gives the rider unprecedented control when taking advantage of PAS Technology not to mention a dramatic increase in power to climb even the most challenging terrane. The Speed Test was difficult to measure out on the streets for the simple reason that this bike is intensely fast and as you can see from the video below, we got it up to just over 80kph in our free wheel test. We went all out on Stark Drive Torque Max which is a 48V based system and we have designed it to be modular and configurable. The base unit includes a 9ah battery pack however its been designed so that these packs are expandable meaning that you can attach extra power to the bike if needed when you are traveling longer distances or simply need power at your destination. All Additional batteries will function as Power Plants through USB meaning you can power your devices wherever you are. USB Charging was a feature of Stark Drive from day one however there are many cases where you dont want to be chained to your bike when you arrive to your destination and with the Stark Drive Power Plant you no longer need to be. Below is your base model Stark Drive Torque (SDT) based on a very powerful 36V system which coincidentally means that that the powerpack can out put more Ah meaning longer ride time with the same size pack as compared to Stark Drive Torque Max above. SDT uses a Bafang based complete Mid Motor Torque Drive system which is completely integrated from an electronics perspective. The display as you can see below is crisp, clear and a GUI is as detailed as it is comprehensive with a lot of information such as assist level, trip distance, total distance, Max speed etc.. In our increasingly connected world, it was not going to be long until there was an app for your bike and here it is. As our system is completely based on a Standard Bafang Package, it also means that our bike is 100% compatible with the Bafang Go App which works on iPhone and Android based system. There is simply not enough real estate on the built in display that comes with the bike in order to display all the information continuously being acquired by the drive system so this app gives you the opportunity to customize the interface to display that information that is relevant to you. We will have more information out SDT as well as SDM coming in the near future. Here is one of the competitors to Stark Drive Mini. Its called the Swagtron but there is one glaring issue with labelling it as a competitor as its not an electric bike at all. The Swagtron is a throttle equipped scooter. Once you run out of power, your going to be carrying it to your destination and it only has a range of 10 miles or 12 km which even our base Mini beats. Not to mention that If you do run out of power with Mini, you can conveniently pedal to your destination. Stark Drive Mini Launching on Indiegogo on December 15 2018 at 12:00 pm (GMT+1) Stockholm Time. Its also claimed in the advertising that this is a folding bike which of course is a bit misleading. the only thing that folds on this bike are the handlebars, the main frame itself does not fold like Mini does and as such if you do live in an older building or have a cramped elevator or staircase, it will be exceedingly difficult to being the Swagtron with you. The battery on the Swagtron is not removable so that once you run out of power you need to wait for the batteries to recharge which could take hours. The rear wheel is exceedingly small and not standard meaning that you will be depended on getting proprietary replacements from the manufacturer. Its not such a great deal at $299 if anything goes wrong as was discussed in a review on amazon. There are a lot of things lacking with this bike that we include by default with the Mini although its nice to see that they have a bike computer as standard. Indiegogo: December 15th ➠ Which Mini Is Right For You? 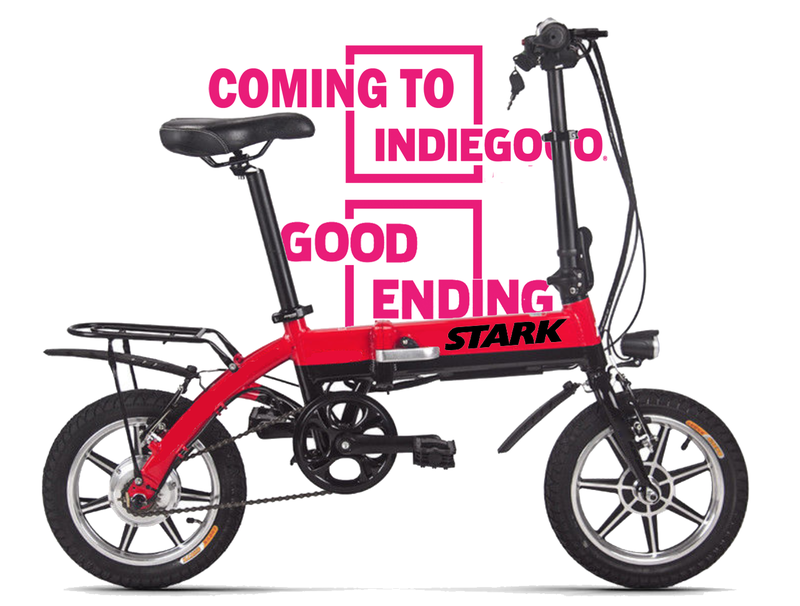 We are super excited to be working with Indiegogo again for the upcoming worldwide launch of Stark Drive Mini (SDM): the most affordable and customizable electric bike ever! 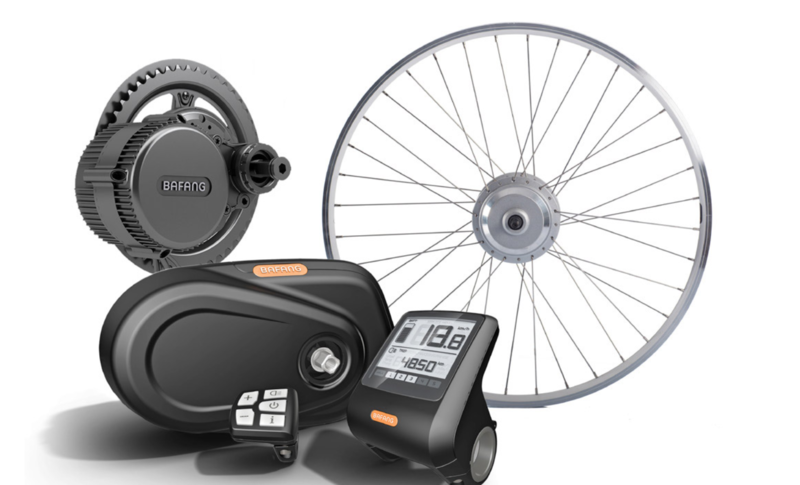 As a base model, SDM will start at a mind-blasting $299 US which is even more affordable than some of our toughest competition such as Swagtron and our bike still operates as a bike unlike some of our competition which are electric only. We are aiming to cover the gambit of all last mile usage case scenarios with the launch of SDM whether it is someone that wants an ultra affordable and ultra light last mile transporter which they can sling over their back with our custom designed carrying case or on the other side an ultra compact powerhouse with a powerful 350W motor and upgrades in cruise control, display, as well as ultra durable disc brakes. Now there is a misconception that perhaps exists whereby people think that a 350W motor is not very powerful and although there exists more powerful motors on the market such as up to 1000W one must also consider the weight of mini plays a significant factor in the acceleration of the bike off the line as well as the top speed. Think of it as putting a V8 motor in a Geo Metro which used to operate on a 3 cylinder engine. Due to the low weight of the car itself, even though there are more powerful engines on the market, the V8 turns the metro into a powerhouse. The same is true for the 350W version of Mini which is the highest possible motor we could fit on these ultra compact wheels. The acceleration is mind blowing and the range is incredible. We have also stayed true to our philosophy in adopting our configure to your unique usage case scenario on our upcoming launch. You can pick a host of options depending on what you need from a basic bike computer to a very advanced large format display to cruise control and throttle and even different sizes of battery packs that would even allow you to legally take SDM on a plane removing the hassles of finding transportation when you arrive to your destination. We even have the option to change the tradition steel chain out to a carbon belt drive system which not only lasts much longer, and requires less maintenance but is also lighter. Our visit to Burning Man 2018 was a huge success with SDM stealing the show on the agility courses that were set up at the event. There will only be a limited number of Early Bird units that launch at our unbelievable price of $299 so stay tuned to Indiegogo on December 15th at Noon Swedish Time (GMT+1) to get yours. Whether you Take the Subway, Bus, Boat, RV, or even Plane, Stark Drive Mini is your faithful companion which will get you there with ease. Ive long been a fan of public transportation but with the advent of electric bikes the range of travel has increased dramatically considering that most people use the bike as tool for commuting to another destination and not wanting to arrive tired and sweaty. There is of course public transport but you are frequently left with a lot of idle time while you wait for the bus or subway. One of primary reasons people choose to take a vehicle is that they dont have the luxury of time when they need to get something done. Cycling has been an excellent alternative however until recently you were still left with several hinderances to using a bike such as weather conditions, and the simple distance that needs to be covered in a specific amount of time not to mention if you wanted to be carrying a load with you say if you were to go to the supermarket or out shopping. Then there was of course the problem of securing your bike once you get to your destination to ensure that your chosen environmentally friendly mode of transportation will still be there when you return. From the start of Stark Drive i have tried to find the best compromise with affordability and ease of use while focusing on the bike as the sole means of transportation. From my perspective it was clear that biking somewhere is the best way to travel and that a folding bike was your best option once you got there as you could either take it with you up to the office or secure the entire bike (not just a single wheel or the frame) to a piece of street furniture with a heavy duty lock to ensure that nothing happened to it while you were out doing your business. Although for me Stark Drive was the perfect bike enabling me to take it with me wherever i go and ultimately to even bring it up with me to my apartment or up to the office I felt it could still be improved. Not only from from a cost perspective but also to make it even more portable as improvements in both battery technology and motor technology over the last few years has helped to shrink components while maintaining the same or better power levels and energy density. Thus came our next iteration of Stark Drive: Stark Drive Mini which for now is my primary daily driver. It is exceptionally light coming in at about 13kg and also packs a lot of power with a motor of up to 350w which combined with a high capacity battery can get you where you need to go without even needing to pedal. With Stark Drive Mini you dont even need to worry about locking your bike, combine mini with one of our carrying pouches and you can bring it right in with you after you are finished your journey and the bag even doubles for carrying your shopping once you are ready to ride home. The Bag we have designed includes wheels so that if you do not feel like carrying Mini on your back you can roll it along with you not needing to break a sweat and feeling confident that your mate is safely with you at all times. 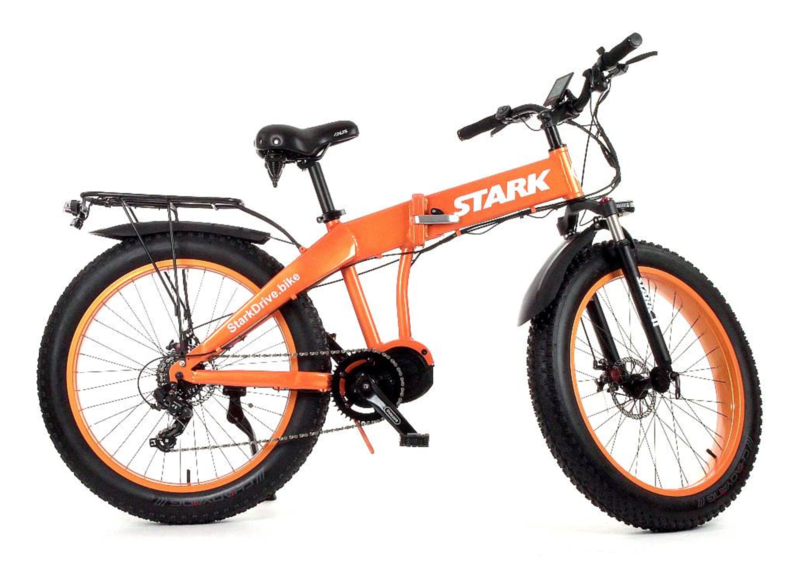 While we feel that both Stark Drive and Stark Drive Mini address a wide gambit of usage case scenarios, there is still one aspect that we feel was lacking and that was of the performance all terrain bike that will help you up those steepest hills and roughest terrain and we have been working hard to keep our schedule for releasing the next iteration of Stark Drive in both Regular and Fat tire called Stark Drive Torque. Recently after receiving our prototype Stark Drive Torque models we have been testing them extensively. It's no suprrise when talking about a torque based electric bike that the torque system itself comprises a huge percentage of the total cost of the bike itself, much more so then a hub motor based electric bike. We have been working with our manufacturing partners and in tern with suppliers to our partners to bring the price down so that in short course we will be launching a torque based electric bike. The cost of this bike for comparison purposes if we take into account the historcal cost of electric bikes will be on par with what a hub motor based electric bike cost just a few years ago. And herein lies our companies mission: to lower the barrier of entry to electric based transportation. In order for any technology to become mass market and affordable you have to have a critical mass of people that are buying the product to help to reduce the cost along the entire product development chain. This is similar to what crowdfunding websites are doing when someone with a campaign has created a new gadget or gizmo that previously cost a lot more but they have developed a way to manufacture it in a better and faster way helping to pass those savings onto you: consumer. Of course, when speaking of crowdfunding not all campaigns are successful and some ideas or products are before their time. Such may have been the through process when just a year ago we launched Stark Drive for an entry price of $399 USD. Many people doubted that we could create an electric bike for such a low cost but we proved them wrong. About 2 months ago we launched Stark Drive Mini on Kickstarter. 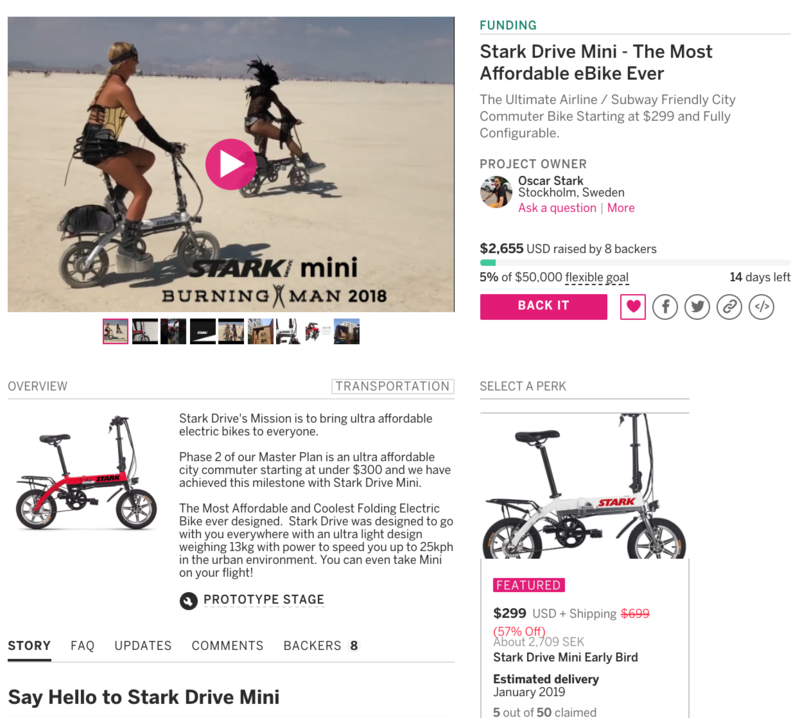 Stark Drive Mini Started at an unbelievable $299 US. This for some people was once again something they considered impossible espeically when similar products were selling on ebay, alibaba, or amazon for 4x the price. We were once again criticized for having unrealistic expectation and that we could never deliver a high quality product at such a rock bottom price. Let me be the first to say that Stark Drive will once again prove them wrong. All of us that work with Stark Drive do so not for fame or wealth, as we do not have any salaried employees but rather we work for the betterment of environmentally friendly transport and to make the benefits of switching to electric transportation so desirable that many will feel there is no choice but to do so as financially it no longer makes sense to choose anything else. For example the cost of a monthly pass for public transit is approximately $100 US. Now you could continue to use public transit but as the prices for this keep going up and our electric bikes keep getting more and more affordable, there will come a point when for the cost of a monthly pass you can just buy an electric bike that works all the time, without needing to buy a subscription to use it. The same is true with the mass distribution of scooters which have become all the rage lately in the USA and even in the EU. People are able to pick up a scooter with the help of an app and pay based on the total time they use the scooter. I think the scooter market is an excellent one that is yet to be tapped and given the Stark Drive Treatment. Arguably its even more portable than Stark Drive Mini and still gives you the range you need to get you from point a to b and is easy to fold and carry with you. After a recent visit to our contracted battery manufacturer i wanted to share with you some photos and videos of the process. note: photos taken are not photos of our batteries being made, but merely their general operations, as you can see the shape of the batteries they are making in the photos is contrary to our own powerpacks. Its worth noting that the Lithium cells that we use in Stark Drive are not actually made in China, they are made in Japan (which is what our manufacturer has guaranteed us) but the pack itself is assembled in China. The main benefits of a Chinese assembly are the labor costs which are significantly lower then in Japan, however even these are rising making way for some Chinese manufacturers (not necessarily in the battery industry) to sub contact out manufacturing to other neighboring countries such as Thailand, Vietnam etc. This is a good thing as it help to raise the standard of living in these countries as well by bringing investment capital. Further as the final assembly is done in these countries, there may not be the same import duties involved when one then ships the product with the all important *MADE IN ______ * label. 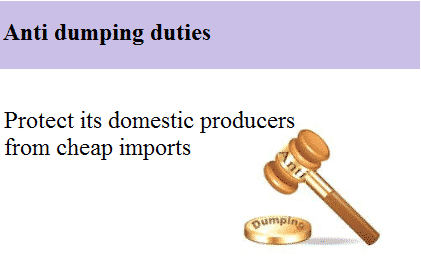 For example recently there has been a significant anti dumping duty imposed in the EU member states (~84%) as well as in the USA (25%) - a country that until recently had no import duties at all on electric bikes. The batteries arrive to the assembly factory already assembled and labeled and the factories job is to combine them in the right parallel and serial connections in order to achieve the required Voltage and Current required. Stark Drive uses a 36V system on our bikes currently with an upgrade planned to 48V in the near future for all our bikes. Think of a Volt as the “force” pushing Amps through the system. The higher the voltage, the more energy can be moved, or the faster it can be moved. So, a higher voltage system can send more energy through the circuits to the motor. 36V batteries are common, but some high performance bikes get 48V batteries. All else being equal, a higher Voltage system will deliver more torque for quicker starts, but it will drain your battery faster.Think of Volts as the. Watts = Volts x Amps. Or, think of it as Force x Volume. Lets say you have a 10A 36V battery, then it’s able to produce 360 watts. This is the real measure of power that a system has. The higher the Volts, the more Watts you will get out of the system so upgrading the system voltage will have a big impact on the total amount of power that can be delivered to the controller and consequently to the motor giving you more acceleration or umph (to put it scientifically) when starting out on your Stark Drive. Further with a higher amount of available power you end up being able to achieve higher speeds with all things such as rider weight, terrane, wind conditions, temperature being equal. Above you see cells that have already been welded together in the proper configuration in order to be sealed and then connected to a battery housing for eventual use in Stark Drive. There is a lot of electronics that get added to this system to ensure balanced charging to measure system voltage and temperature and other functions to ensure the health and longevity of your battery pack. Here you see workers combining the cells in guides and adding some all important electronics and protection circuitry. This is battery testing equipment that measures all the important aspects of the packs to ensure they are of the highest quality before they leave the factory. Here finally we see some Stark Drive packs all finished and ready to go. Here we see packs not meant for Stark Drive in a much higher power configuration. Which one would you want? Both have the same Watt Hour rating. 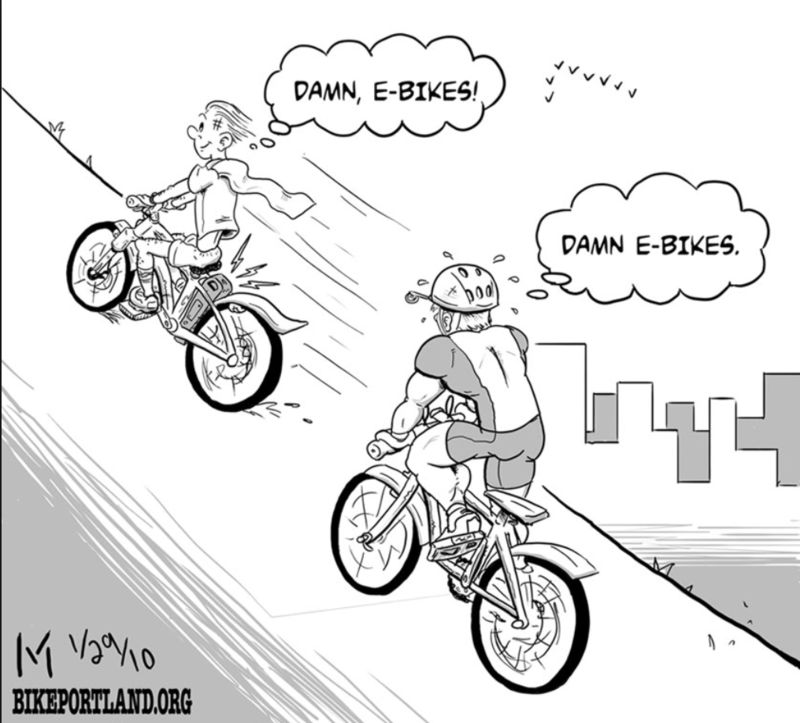 But Bike A has more available energy stored in the battery. Bike B has half the capacity, but because its voltage is twice as high as Bike A, the Watt Hours rating the same. Technically, both could be designed to perform similarly, but higher voltage systems are usually used for faster power delivery for quicker acceleration rather than efficient cruising. Think of Bike A as a fuel efficient V6 in a minivan, and Bike B as a turbocharged, nitrous-equipped V6 fed by a high pressure fuel pump. You cooooould ride Bike B like a minivan, but you’d be wasting its potential. In reality, virtually every street legal e-bike’s power output is regulated by law, which is why most are 36V systems however as the laws are written so poorly in the EU for example, you could take a 250W motor, connect it to a 72V system with a 10ah battery and 20amp controller and although it would shorten the motor lifespan, it would definitely give you a thrill when riding down the street at 100kph.